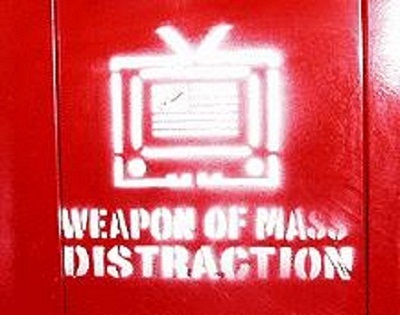 It’s a Weapon of Mass Distraction …..
We’ve survived perfectly well for over 200,000 years without TV, but now the average person in the Western world watches over 4 hours of TV a day. Numerous research studies show that the more TV we watch, the less likely we are to achieve what we want and be happy. If we feed our brains garbage, then it’s very much a case of Garbage In = Garbage Out (G.I.G.O). Regardless of the TV, sitting for extended periods has an adverse effect on metabolism, enzyme production and blood profile. It’s been said that sitting is the smoking of our generation. One of the most revealing pieces of research into the effects of TV was undertaken in the Kingdom of Bhutan. Until 1999, TV had been banned. But after 1999, the ban on TV was lifted and the Bhutanese had access to nearly 50 cable channels showing the usual mix of "entertainment". Within a year of TV arriving in Bhutan, there was a significant increase in crime, violence, drug taking and marital break ups. Another study showed that a third of parents in Bhutan preferred watching TV rather than talking to their children. We tell our kids that if they do their homework and spend less time in front of the TV, they’ll get an excellent report card at the end of the year. Do we need to take a little of our own advice? I didn’t realise I was dyslexic until I went to a toga party dressed as a goat. You can fool some of the people all of the time, and all the people some of the time, which is just long enough to become a politician. This entry was posted by admin on March 10, 2013 at 8:05 am, and is filled under Sunil Bali, The Art of Awesome Living, The Book of Awesome Humour. Follow any responses to this post through RSS 2.0. Both comments and pings are currently closed.